Given that we regularly answer questions like, “How often does product X have its prices checked?”, we think it’s a good idea to regularly post statistics about our price checking system. This is the first post in that series. This depends on a number of things, the first of which is the retailer. Newegg and Best Buy are checked every few hours, and zZounds and Backcountry are checked a couple of times per day. However, prices at these retailers don’t fluctuate that often, so we don’t always see price changes every time we check (even though we check all of the products they make available to us). Amazon is a different story: in many cases, their prices appear to change as often as we can check them, and their product catalog is so massive that we do not have a complete copy of it. Our database is populated by users searching our site and by users of our browser extensions. 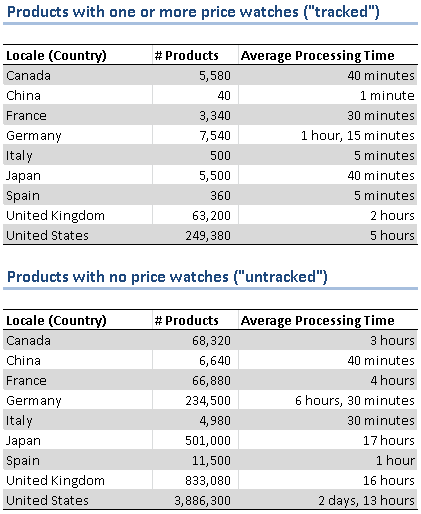 Even so, we monitor the prices of about 6 million Amazon products across 9 different locales. The vastness of Amazon’s catalog is what prompted us to publish this data in the first place. We want everyone to understand how our system works and why that means we sometimes miss price changes. When checking product prices, we break products down into 9 groups based on locale – meaning the US products go in one group, UK in another, etc – and then break each of those groups down into 2 sub-groups. One (the “tracked” sub-group) contains all products which have at least one price watch, and the other (the “untracked” sub-group) contains the products with no price watches. All groups (and sub-groups) are updated in parallel, which usually means the smaller groups and sub-groups update faster than their counterparts. The lesson here is simple: if you want a product’s price checked regularly, create a price watch. Now that you understand a little bit about how we queue products for price checking, on to the data! As you can see, many of the products in our system are updated every few hours, some hourly, and some multiple times per hour. We’re working hard to improve the times of those big groups of products (US untracked, for example) and hope to bring our processing time for all Amazon products down to one day or less. Hourly updates for all Tracked products is also one of our goals. Let us know what you think of this post in the comments. We could do more of this kind of thing if people are interested.